Smollett who arrived in Chicago from New York late Monday, and at around 2 AM was hungry and went to a Subway with plans to get food. However, he was attacked. As reported by TMZ from a reliable source connected to the actor. There seem to be a growing hatred for the actor as most sources had earlier reported he has been threatened on several occasions. So it wasn’t the first time Jussie is being targeted by homophobes. 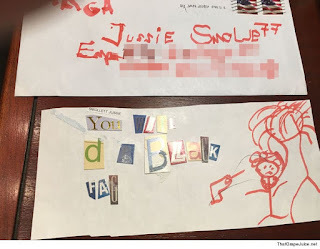 Just 8 days ago, a letter for Jussie was sent to Fox Studios in Chicago with cut out letters spelling, “You will die black fag.” The envelope the letter arrived in appears to say MAGA in the upper left corner. Chicago PD said they are investigating the attack as a possible hate crime, and they are canvasing the area for any video. Few hours after the incident, Lee Daniels reacted to the event as he was seen on social media expressing his emotions regarding the homophobic attack on the Empire actor. Recall that Lee Daniels, had publicly called Jussie Smollett his son.